North Bellmore, Long Island, New York, U.S.
Ali was born in North Bellmore, New York on January 24, 1979, the eldest daughter of Sheriff and Sonia Ali. Tatyana is of Panamanian and Indo-Trinidadian descent. In 1985, 6-year-old Ali began her acting career as a regular child performer on Sesame Street and appeared with Herbie Hancock in a musical number. She also appeared twice on Star Search. She made her breakthrough in 1990, when cast as Ashley Banks for the television sitcom The Fresh Prince of Bel-Air. She sang on various episodes of the show, including a heavily altered version of Aretha Franklin's "Respect" and the original song, "Make Up Your Mind", produced by Robert Jerald of N'Spyre Music Productions. Will Smith asked her if she seriously considered pursuing a musical career. However, despite her singing ability, Ali concentrated on her acting career on The Fresh Prince of Bel-Air. In the series' final season (1995–96), Ali began preparing herself for her musical debut. The result was the album Kiss The Sky, which was certified gold in early 1999. The album spawned the hit song "Daydreamin'", released July 21, 1998, produced by Rodney "Darkchild" Jerkins, which peaked at No. 6 on the Billboard Hot 100 and on the UK Singles Chart. She also performed the title song, "Sunny Valentine" along with Terrence Quaites for the indie film, Rockin' Meera directed by Param Gill in 2005. In 2009 and 2010 she produced and starred in the BET web show, Buppies. She is currently on recurring status on the CBS soap opera The Young and the Restless as Roxanne. Ali can be seen in the show, Love That Girl! on TV One. She stars as Tyana (which comes from the last five letters of her name). When asked if the character bears any similarities to her, Ali said in a CaribPress interview, "She's a bit neurotic and I hope I am not quite like that." "One thing that I do love about her is that she is really multidimensional," she went on to say in the same interview. "I think it's nice to have a female character that is portrayed in (a) really holistic way." Ali also starred in Nora's Hair Salon and Nora's Hair Salon 2: A Cut Above. In 2011, Ali received the Living Legacy Award from the Caribbean Heritage Organization in Los Angeles. In 2012, Ali appeared as a guest on The Eric Andre Show. Ali's most recent role, as of January 15, 2013, is starring as Maya, along with Craig Wayans and Damien Dante Wayans, in the BET comedy, Second Generation Wayans. In January 2014, Ali released a new EP entitled Hello, with her first single "Wait For It", which she also performed on The Arsenio Hall Show on February 4, 2014. In July 2016, Ali sued Warner Bros claiming that the company used her idea for the show The Real after she pitched the concept in December 2012. The case was dismissed in February 2017. Ali attended Harvard University, where she received a bachelor's degree in African-American studies and Government in 2002. She traveled the United States as a spokesperson for Barack Obama's 2008 presidential campaign and headed voter registration drives at college campuses. In 2012, she continued showing her support. She dated Jonathan Brandis from 1995 to 1998. In March 2016, Ali revealed that she was engaged to Vaughn Rasberry, assistant professor of English at Stanford University, whom she had met on eHarmony, . She added that they were expecting their first child. She and Rasberry married on July 17, 2016 in Beverly Hills, California. The couple have a son born in September 2016. They are currently expecting their second child. 1989 A Man Called Hawk Michelle Episode: "Life After Death"
1989 The Cosby Show Girl Episode: "Shall We Dance?" 1992 Where in the World Is Carmen Sandiego? Herself Episode: "The Nefarious Nobel Napper"
1994 Are You Afraid of the Dark? Laura Turner / Connie Turner Episode: "The Tale of the Quicksilver"
1995 In the House Ashley Banks Episode: "Dog Catchers"
1996 Living Single Stephanie James Episode: "Whatever Happened to Baby Sister?" 1997 413 Hope St. Kai Episode: "Heartbeat"
2002 Fastlane Shelly Episode: "Girls Own Juice"
2003 Half & Half Olivia Episode: "The Big Condom-nation Episode"
2007 Boulevard of Broken Dreams Herself Episode: "Jonathan Brandis"
2007 On the Lot Herself Episode: "First Sight"
2012 The Eric Andre Show Herself Episode: "Tatyana Ali"
2015 Key & Peele Heresa Episode: "Hollywood Sequel Doctor"
2016 Zoe Ever After Ashley King Episodes: "The Interview" and "Game Face"
2018 Hollywood Darlings Tatyana Episode: "Big White Lies"
2018 Olive Forever Alison Episode: "Pilot"
"Love The Way You Love Me"
2011: Nominated, Outstanding Actress in a Comedy Series – Love That Girl! 2012: Nominated, Outstanding Actress in a Comedy Series – Love That Girl! 2013: Nominated, Outstanding Actress in a Comedy Series – Love That Girl! ^ "Tatyana Ali Biography (1979-)". Filmreference.com. Retrieved October 13, 2017. ^ "Happy Birthday, Tatyana Ali". People Magazine. People Magazine. January 24, 2017. Retrieved January 20, 2019. ^ "Episode #1.8728". September 17, 2007. Retrieved October 13, 2017 – via www.imdb.com. ^ a b c d Ofole-Prince, Samantha (August – September 2011). Wheaton, Robert (ed.). "The talented Ms. Ali:an interview with Tatyana". CaribPress Newsmagazine. Los Angeles: 5. Retrieved August 17, 2011. ^ a b Wheaton, Robert (August – September 2011). Wheaton, Robert (ed.). "Caribbean Heritage Salute in Hollywood". CaribPress Newsmagazine. Los Angeles: 21. Retrieved August 17, 2011. ^ "The Eric Andre Show: Tatyana Ali Interview". YouTube. June 5, 2012. Retrieved October 13, 2013. ^ Pedersen, Erik (July 16, 2016). "'Fresh Prince' Actress Sues Warner Bros Claiming It Used Her Idea For 'The Real'". Deadline Hollywood. Retrieved October 13, 2017. ^ Evans, Greg (February 24, 2017). "Court Tosses Tatyana Ali Lawsuit Claiming 'The Real' Was Her Idea". Deadline Hollywood. Archived from the original on February 25, 2017. ^ "Tatyana Ali Shares Her Black Experience at Harvard University". BET. December 12, 2012. Retrieved June 21, 2012. ^ "Tatyana Ali wants young people to know their voice counts". 9news.com. August 8, 2008. Archived from the original on January 16, 2013. Retrieved November 27, 2012. ^ Baker, Mike (April 9, 2008). "NC Voter Registrations Surge". seattletimes.com. Retrieved November 27, 2012. ^ Wakhisi, Tsitsi D. (November 1, 2012). "Early voting a hit in South Florida". sfltimes.com. Retrieved November 27, 2012. ^ "Tatyana Ali announces engagement and pregnancy". Mail Online. Retrieved May 31, 2018. ^ Harrison, Lily. "Fresh Prince of Bel-Air's Tatyana Ali Reveals She's Engaged—and Pregnant". E! Entertainment Television. ^ Dugan, Christina (July 17, 2016). "Tatyana Ali Marries Dr. Vaughn Rasberry". People.com. Retrieved July 19, 2016. ^ Hautman, Nicholas (July 17, 2016). "Tatyana Ali Marries Vaughn Rasberry". Usmagazine.com. Retrieved July 19, 2016. ^ Mizoguchi, Karen (April 13, 2019). "Tatyana Ali Expecting Second Child With Husband Vaughn Rasberry". People.com. Retrieved April 18, 2019. ^ "Billboard Chart History: Tatyana Ali". Billboard. Retrieved November 2, 2017. ^ "Top R&B/Hip-Hop Albums: Tatyana Ali". Billboard. Retrieved November 2, 2017. ^ a b "UK Charts – Tatyana Ali". Official Charts Company. Retrieved November 2, 2017. ^ "Official R&B Albums Chart Top 40: 14 February 1999 – 20 February 1999". Official R&B Singles Chart Top 40 Archive. Official Charts Company. Retrieved November 2, 2017. ^ "Hello by Tatyana Ali". iTunes. Retrieved November 2, 2017. ^ "Billboard Hot 100: Tatyana Ali". Billboard. Retrieved November 2, 2017. ^ "Hot R&B/Hip-Hop Songs: Tatyana Ali". Billboard. Retrieved November 2, 2017. ^ "Belgium Charts – Tatyana Ali". Ultratop. Retrieved November 2, 2017. ^ Steffen Hung (March 13, 1999). "Les charts français". lescharts.com. Retrieved November 2, 2017. ^ "Search the Charts: Tatyana Ali". The Irish Charts. Irish Recorded Music Association. Retrieved November 2, 2017. ^ Steffen Hung. "– Dutch charts portal". Dutchcharts.nl. Retrieved November 2, 2017. ^ Steffen Hung. "– New Zealand charts portal". Charts.org.nz. Retrieved November 2, 2017. "Daydreamin'": "15 November 1998 – 21 November 1998". Official R&B Singles Chart Top 40 Archive. Official Charts Company. Retrieved November 2, 2017. "Boy You Knock Me Out": "07 February 1999 – 12 February 1999". Official R&B Singles Chart Top 40 Archive. Official Charts Company. Retrieved November 2, 2017. "Everytime": "13 June 1999 – 19 June 1999". Official R&B Singles Chart Top 40 Archive. Official Charts Company. Retrieved November 2, 2017. ^ "US certifications: Tatyana Ali". Recording Industry Association of America. Retrieved November 2, 2017. ^ a b Scapolo, Dean (2007). The Complete New Zealand Music Charts: 1966–2006. Wellington: Dean Scapolo and Maurienne House. ISBN 978-1877443-00-8. ^ "Search Results: Tatyana Ali". British Phonographic Industry. Retrieved November 2, 2017. ^ "Wait for It by Tatyana Ali". iTunes. Retrieved November 2, 2017. ^ "More!". Discogs. Retrieved November 2, 2017. ^ "The Adventures of Elmo in Grouchland". iTunes. Retrieved November 2, 2017. ^ "Kanary Diamonds". iTunes. Retrieved November 2, 2017. ^ "So Far – the Collection". iTunes. Retrieved November 2, 2017. ^ "Love N' Dancing (Original Motion Picture Soundtrack)". iTunes. Retrieved November 2, 2017. ^ "Dear Secret Santa Soundtrack". iTunes. Retrieved November 2, 2017. ^ "The Legacy of R&B Slow Jamz". iTunes. Retrieved November 2, 2017. ^ "The Legacy of Nu Soul". iTunes. Retrieved November 2, 2017. ^ "Music to Inspire: Artists UNited Against Human Trafficking". iTunes. Retrieved November 2, 2017. ^ "44th NAACP Image Awards Full List of Nominees" (PDF). NAACP. Archived from the original (PDF) on March 19, 2013. Retrieved December 12, 2012. 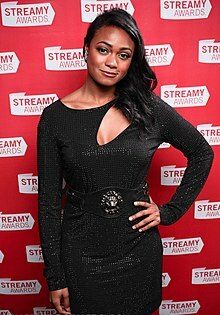 This page is based on the Wikipedia article Tatyana Ali; it is used under the Creative Commons Attribution-ShareAlike 3.0 Unported License (CC-BY-SA). You may redistribute it, verbatim or modified, providing that you comply with the terms of the CC-BY-SA.